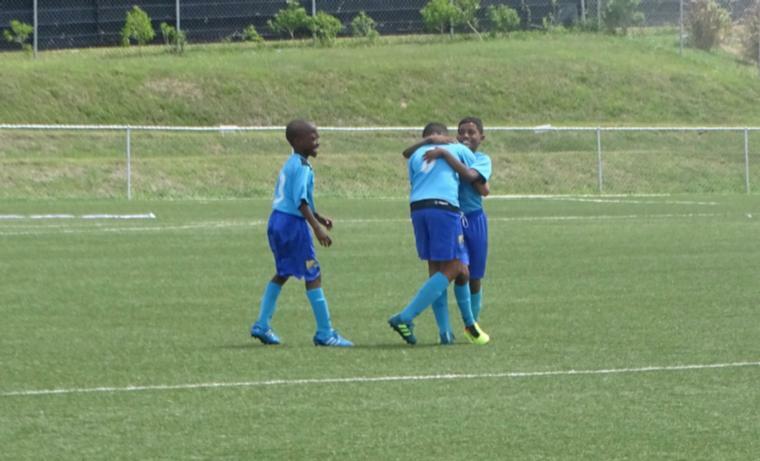 The chase is on in the Barbados Premier League as the home stretch is within sight. With only five games left across the board, teams will be letting it all hang out as they put in their final bids in the title race. 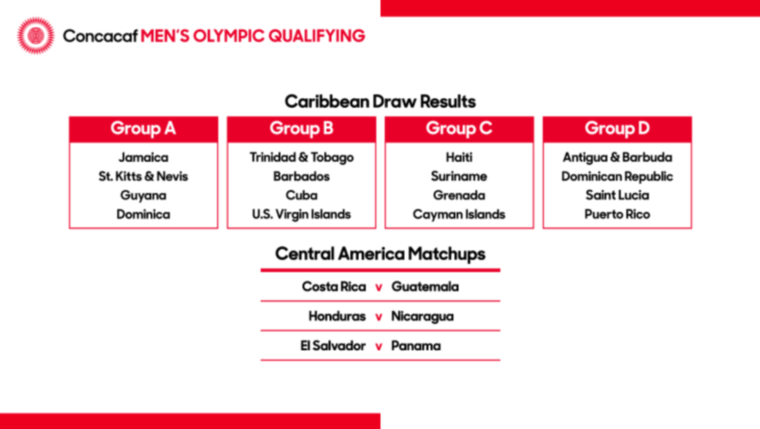 Playing out-of-zone fixtures for the second time around, all eyes will be on group leaders Weymouth Wales and the Barbados Defence Force Sports Programme as the two are are on a collision course for the championship. Wales (32) have a handsome lead in Group 1 with six points on second place University of the West Indies Blackbirds. The two-time defending champions have racked up 10 wins, two draws and five losses in their 17 games while the Blackbirds have have seven wins, five draws and five losses for 26. After going a bit soft in the middle, Clayton's Kola Tonic Notre Dame have found just enough form to pull themselves up to third place with six wins, three draws and eight losses to amass 21 points. Their position is relatively safe barring a complete meltdown as Brittons Hill United have 14 points from three wins, five draws and nine losses. 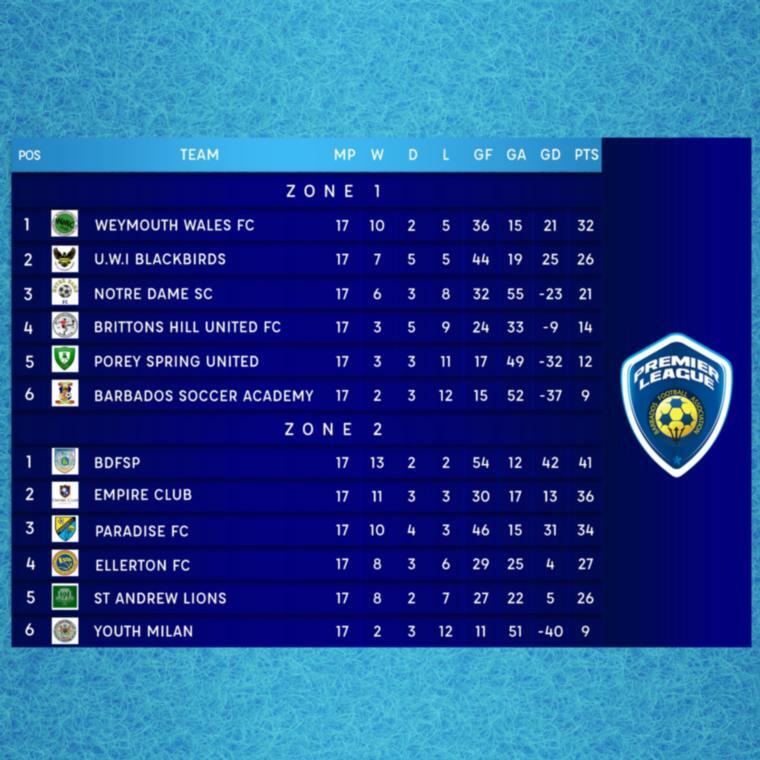 Mark's Auto Spares Porey Spring and RBC Capital Markets Barbados Soccer Academy are the teams who find themselves in the red with 12 and nine points respectively. Porey Spring are still in with a chance to get out of the relegation zone if they can add something positive to their three wins, three draws and 11 losses. Unless they can have a turnaround and win all of their remaining games, BSA will definitely be playing a relegation playoff as they currently sit at the bottom of the barrel with two wins, three draws and 12 losses. In Group 2, the soldiers, who have won several titles, lead with 41 points after rolling to a record of 13 wins, two draws and two losses. They are followed by Empire Club (36), who had a hot start but have eased off the accelerator. The 'Blues' have passed up the lead as they now stand on 11 wins, three draws and three losses. Things continue to be tight in this group as last year's Champions Cup winners, Paradise FC are in third place with 34 points from 10 wins, four draws and three losses. Crane and Equipment Ellerton round out the safe teams with 27 points after coming with eight wins, three draws and six losses. Scotty's Car Rentals St. Andrew Lions are in the red but still in the running as they are just one point off the pace with 26 from eight wins, two draws and seven losses. Youth Milan are destined for the playoffs as they languish in sixth place on just nine points. They have two wins, three draws and 12 losses. The action picks back up this weekend with games at the Wildey Turf. 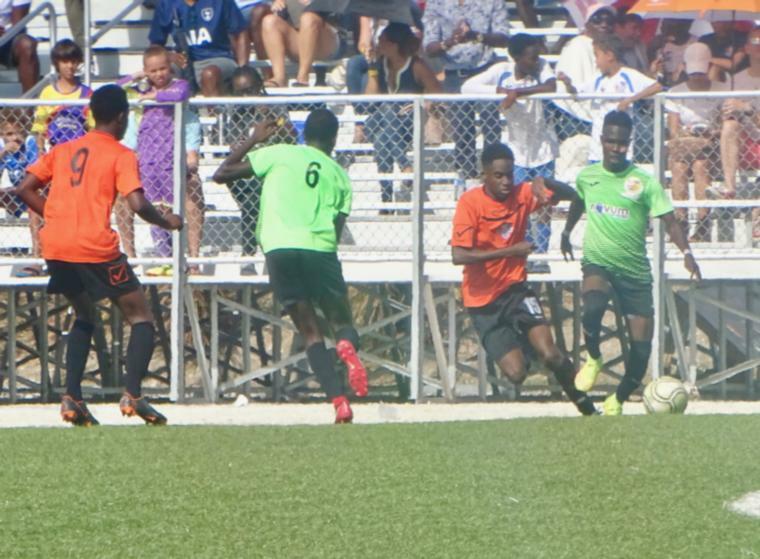 Wales will be giving the next few rounds of cross-zone games a miss as they are in Curaçao for the 2019 edition of the Concacaf Caribbean Club Shield where they will be playing against SV Real Rincon of Bonaire and Club Sportif Moulien of Guadeloupe. Instead, Wotton FC and Silver Sands will be going head-to-head in Saturday's first game at 5:00 PM. 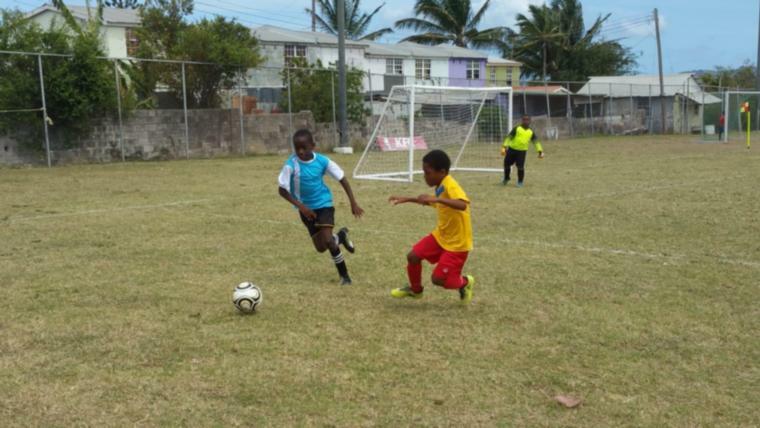 It will be back to Premier League activity at 7:00 PM with Brittons Hill taking on St. Andrew Lions, while Porey Spring and Youth Milan close things out on Saturday. Sunday's action kicks off with Paradise and Notre Dame locking horns at 4:00 PM. 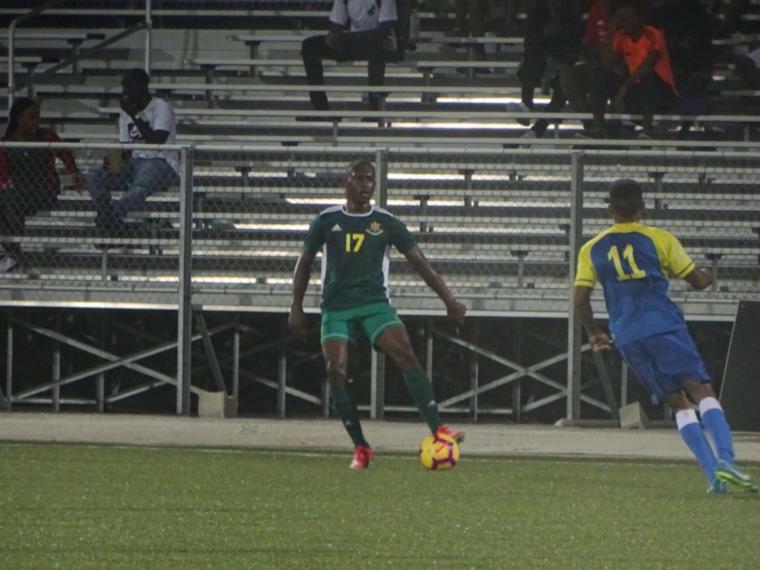 Ellerton and the Barbados Soccer Academy have a date while the nightcap goes to the Blackbirds and the Sports Programme.